Someone or some spirit has been looking out for David Maes “Kawika” Gallegos. With divine timing and serendipity, and in spite of personal crises, deep heartbreaks and challenges, the right person (or angel) has appeared at the right time. The artist’s life, history has shown, isn’t an easy one. The psyche that produces the most inspirational works is sometimes the most fragile one. It’s open to attacks of genius and psychological trauma alike. Yet, in the case of Kawika, he perseveres and awaits the next one. “My best work comes from a severe emotional response, such as a heartbreak. In between, I paint flowers,” says Gallegos. “For Picasso, it was ‘Guernica.’” For Gallegos, in spite of huge success, major commissions and acclaim for his art, his eyes reflect pathos, his face is sculpted with life’s journeys, and still his outlook remains optimistic. Life has formed him into a generous, humble and loving soul, quick to give compliments and a helping hand to others. 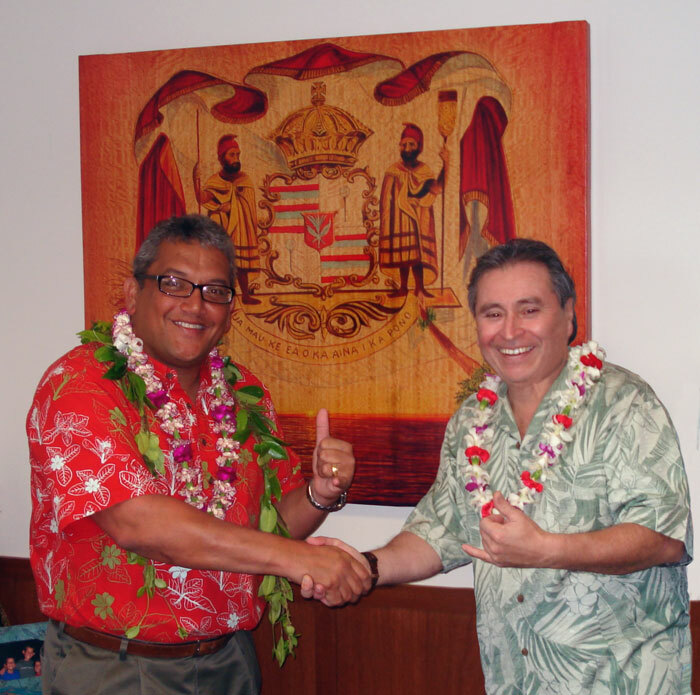 Artist David “Kawika” Gallegos Presenting: “The Royal Hawaiian Seal” to Hawaii Mayor Billy Kenoi. 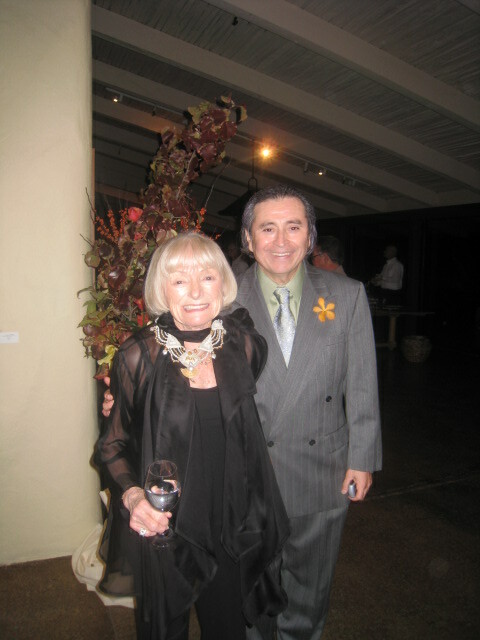 Mrs. Margrit Biever Mondavi and David Gallegos at his Opening at Robert Mondavi Winery January, 2010. 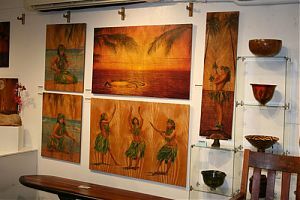 David Gallegos has created a collection of paintings on wood for the The Figure Hawaiian exhibit at the Volcano Art Center Gallery from April 16 through May 22. The public is cordially invited to attend the opening reception to meet the artist on Saturday, April 16, from 5 to 7 pm. While there is no charge to visit the gallery, located in the historic 1877 Volcano House near the Kilauea Visitor Center in Hawai’i Volcanoes National Park, national park user fees will apply. Gallegos uses wood as other painters use canvas or paper. He burns his skillful drawings onto koa or mango with heat tools and then subtly colors them with oil paint. He is fascinated by hula movement. 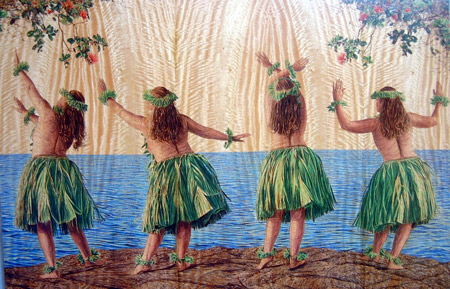 Each Gallegos panel painting features one to three hula dancers, strategically placed to allow the grain of the wood to further enhance his compositions. The work of the artist demonstrates a mastery of the respective media as well as a solid and skillful appreciation of the beauty of the human figure both in motion and at rest. The work in The Figure Hawaiian shows that the artist received classical training. Gallegos earned the Master of Fine Arts at the University of California, San Francisco. He has had numerous one-man shows, on the mainland from Maryland to Alaska with a concentration in the Bay Area of California, plus a number of shows in Japan as well as in Hawaii. 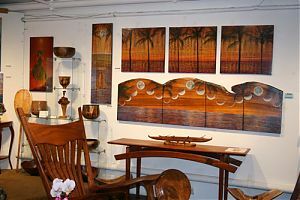 "Harbor Gallery to feature Wood Art from local Artist March 10, 2010"
Individually, the paintings of David “Kawika” Gallegos embody some of the best art of their kind to be found anywhere in Hawaii. Spirit Art Studios create human form and nature in a way that integrates the true spirit and feeling of the people, culture and beauty of these islands with unusual and uniquely created works of art. Latest work is at Harbor Gallery 2 in Kawaihae, starting with an artist’s reception from 5 to 8 tonight. The gallery is located under the Seafood Bar and next to the Kawaihae Harbor Grill at the intersection of Kawaihae road and Akoni Pule Highway. Refreshments will be served, and there will be entertainment by a group of local Hawaiian musicians by the name of Na Lea Le O Na Kupuna. Originally a native of the Denver area, David won scholarships in painting and drawing and moved to the west coast, where he eventually earned his Master of Fine Arts degree in Painting and Printmaking from the University of California San Francisco in 1977. He worked with Tamarind Lithographer Ernest DeSoto and produced pieces for the famous “Art for Peace project,” among other exhibitions, from 1978 until 1990. He also traveled throughout the United States and Europe. The work that David is currently creating is extraordinarily different from anything else to be seen on the island, where he mixes a unique blend of mediums. He starts by selecting a special piece of Koa or Mango wood, veneered to plywood, and sands it many times with finer and finer grits of sandpaper until the surface is perfectly smooth. Then he gets out a wood burning tool, and burns an image into the wood, giving the piece texture as well as distinctive lines that help define the image. Only when he is satisfied with the image does he pull out his oil paints, and by applying 30 or 40 very thin glazes with his brushes, developes the image into the subtle, translucent work that leaves the background wood image showing through, giving each piece a truly spiritual quality. David has been displaying his work at the Harbor Gallery since it was the Kohala Kollection gallery, going back into the early 90’s. David will be available to answer your questions and describe their newest body of work at a reception in their honor from 5 to 8 tonight at Harbor Gallery 2 in Kawaihae, next to the Kawaihae Harbor Grill and under the Seafood Bar. Refreshments will be served. Contact Gunner, Elli or Barbara at 808-9-880-9100 for more information, or contact them at www.harborgallery.biz.